Fans were not pleased this week when they learned that their orders of Ni no Kuni Wizard's Edition were cancelled due to stock shortage. Some were puzzled as to why an eBay merchant, Play Canada, was able to get hundreds of copies of the game; many postulated that there was something sketchy going on. NAMCO BANDAI Games America would like to officially offer clarification to certain stories and sentiments surrounding the Ni no Kuni: Wrath of the White Witch – Wizard's Edition. NAMCO BANDAI Games America would first like to acknowledge our fans that will not be receiving their copy of Ni no Kuni: Wrath of the White Witch – Wizard's Edition. This situation is truly unfortunate, having come about due to a glitch within our E-commerce provider's ordering system. NAMCO BANDAI Games America continues to monitor the situation and is actively working with our E-commerce provider to offer remedies to each and every order. We are also working to ensure that a situation like this never happens again. We respectfully ask for our fans' patience during this time. NAMCO BANDAI Games America is not, nor has it ever, worked with or in conjunction with the EBay seller known as "PlayCanada" to sell units of Ni no Kuni: Wrath of the White Witch – Wizard's Edition at a price premium on EBay . According to our records, this individual or group of individuals purchased Ni no Kuni: Wrath of the White Witch – Wizard's Edition during the NinoStarter promotion period (August 2012); at which time, no limits were placed on how many units an individual could order. PlayCanada's claims that they officially worked with NAMCO BANDAI Games America to obtain their stock is entirely false. We understand the $20 clubNamco voucher that has been offered to our affected fans may give little solace in place of an actual Wizard's Edition package. It is unfortunate that we are unable to produce additional Wizard's Edition units to fulfill all the extra orders; with that in mind, NAMCO BANDAI Games America will be giving the affected fans a 400 page hard bound copy of the Ni no Kuni: Wrath of the White Witch strategy guide which includes an exclusive code to unlock a Gold Hurly Familiar in the game in addition to the original $20 clubNamco voucher. 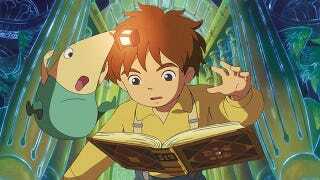 Our E-commerce provider will be contacting the affected customers in the coming days with instructions on how to obtain their copy of the Ni no Kuni: Wrath of the White Witch strategy guide. We hope that this can give the affected consumers some comfort; NAMCO BANDAI truly does value and care about its fans.